Pet Friendly Gated.  Pool.  Fitness Center.  Printing.  Washer and Dryer.  Furnished.  Utilities Included.  Water.  Electric.  Internet. 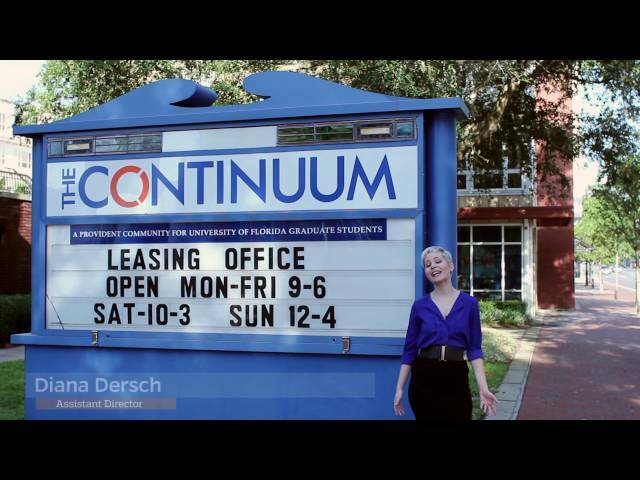 As the official graduate and professional housing partner of the University of Florida, The Continuum is a great apartment complex to continue your schooling. On the bus line and situated between the University of Florida campus and Downtown Gainesville, communting are a few steps away. Life is hassle-free with all-inclusive pricing, cutting edge amenities, and a friendly staff ready to help you achieve a successful professional lifestyle. All buildings feature restricted access, elevators, and secure bicycle storage. Each apartment is fully Furnished and comes with classic features such as faux wood flooring, stainless steel energy-efficient appliances, private bathrooms, in-unit Washer and Dryer, and spacious closets.